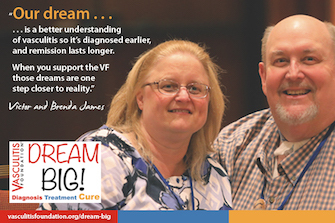 The Vasculitis Foundation THANKS YOU for supporting our Dream Big! campaign. 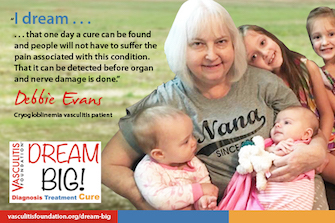 The aim of this campaign—which continues through 2018—is to fast track the advances about which every person impacted by vasculitis is dreaming: faster diagnosis…better, less invasive treatments…and, ultimately, a cure for all forms of the disease. Working together, we are taking enormous strides toward achieving these goals. But we have a long way to go before our task is complete. Please join our efforts to make 2018 the breakthrough year for everyone impacted by vasculitis. …We are the world’s most trusted resource for vasculitis information by patients, caregivers, and healthcare providers. …We are the world’s largest private funder of vasculitis research in the world, having funded more than $2 million of research over the last 16 years. 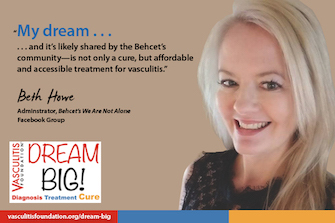 …We host the world’s largest on-line patient support network, where more than 5,000 individuals impacted by vasculitis can meet others battling vasculitis and discuss a broad-range of topics 24/7. …We are educating the next generation of vasculitis experts, who are treating individuals with vasculitis, and conducting leading-edge research that will identify better means of diagnosis, develop less invasive therapies, and, ultimately, find a cure for all forms of the disease. Please continue to DREAM BIG with us! 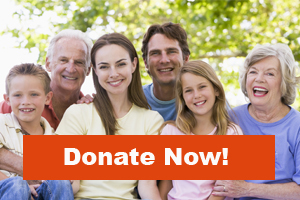 If you haven’t done so already, join our effort to provide life-changing services to the hundreds of thousands of people impacted by vasculitis. 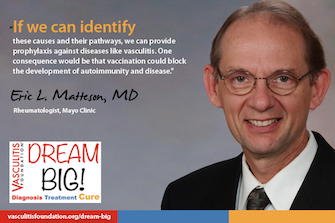 dream big when it comes to Vasculitis.